Chippewa Correctional Facility is located in Kincheloe Michigan. The prison itself is comprised of an East and West side. 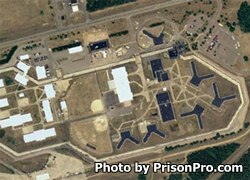 The West side was formerly known as Straits Correctional Facility and consists of eight level II units with 140 beds each. The East side is comprised of three Level II units with 240 beds each, a level I unit that houses 120 inmates, a level IV unit that houses 192 inmates, and an administrative segregation and detention unit that houses 118 inmates. In total this prison can house 2,086 adult male offenders. All inmates incarcerated at Chippewa Correctional Facility are encouraged to participate in the academic and vocational programs offered. While incarcerated inmates can earn a GED, take horticulture classes, join work groups, take religious courses, receive substance abuse treatment and group counseling.